As the society evolves, there is growing awareness about social evils like child labour and poverty. Modern society wants better treatment of fellow human beings, especially children and other vulnerable segments of the society. Business organisations all over the world (especially from the developed nations) are also realising their corporate social responsibility in eradication of child labour, forced labour, discrimination, poverty, etc. Many large organizations such as TESCO, WalMart, etc. are cleaning up their supply chain by asking their suppliers to demonstrate their corporate social responsibility. They prefer to do business with SA8000:2014 certified suppliers. What is SA8000:2014 ? It is an international standard on Social Accountability, published by the Social Accountability International (SAI) which is a non-governmental, international, multi-stakeholder organisation dedicated to improving workplaces and communities by developing and implementing socially responsible standards. The SAI is headquarters is situated in New York, USA. Apart from manufacturing companies, service organizations (both public and private) can also implement SA8000:2014 and get certified. Before inviting a reputed third party certifying agency for audits and certification, your organization must prepare the SA documents (social accountability manual, procedures, forms, etc. ), impart training to employees, implement the SAMS for sufficient period of time, and conduct internal audits. Improper planning and non-completion of documentation are the major reasons for delays in SA8000 certification projects. 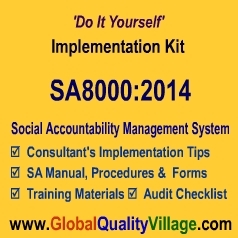 Implementers often lack the know-how of SA8000:2014 documentation and implementation. It is also a fact that just reading text books (or the SA8000 standard itself) may not result in proper documentation and time-bound execution of an SA8000 certification project. What you need is a worked-out example of SA8000:2014 documentation (policy manual, system procedures, forms etc. ), and down-to-earth guidance for practical implementation of SA8000:2014 Management System. Our product has all these virtues. Dozens of customers from all over the world have already purchased this kit and achieved SA8000 certification of their organizations. This kit is also a hot favourite of management consultants who plan to start SA8000:2014 consultancy. 1. Implementation Guidelines: Our management consultants have vast experience in successfully implementing SA8000 Social Accountability Management Systems at various client organisations around the world. On the basis of their experience, our consultants have prepared a step-by-step system implementation guideline that provides clear directions to managers (management representatives) who would plan and implement the system. Following these guidelines could help cut down the cost and duration of your SA8000 project substantially. 2. Sample Documents: These Word / Excel templates include fully developed Policy Manual, System Procedures, Work Instructions, and Forms. We have also included a detailed document customisation guideline (in PDF format). Written in simple English, you can customise the document templates easily to suit your SA8000:2014 requirements. You can retain 80% text as it is, and need to modify only 20% by putting in your company-specific content. The 33 standard forms (blank) included in this kit can be used with very minimal changes. 3. Training Materials: This kit also includes two self-learning / in-house training material in PDF format (one on SA8000:2014 standard, and the other on internal auditing). 4. Internal Audit Checklist: Finally, there is an exhaustive audit checklist (SA8000:2014 clause-wise, very similar to the checklists used by auditing agencies) which you can use for initial gap analysis as well as routine internal audits. Note-01: This kit is suitable for both manufacturing and service organizations. Note-02: We also provide eConsulting support for SA8000:2014 implementation and certification at a very reasonable fee.